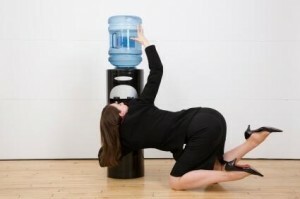 86% of respondents believe that they should be drinking five or more glasses of water a day, yet only 13% actually are. 46% of respondents are drinking only one or two glasses of water a day at work. 64% of companies reported that men don’t drink as much water at work as women; instead they turn to tea, coffee and soft drinks; they also tend to be less health conscious than women, and not as aware of the health benefits of drinking water. “Drinking seven to eight glasses of water a day is ideal and while 53% of respondents agree, it’s not being put into practice in the workplace,” says Buckley. Convenience was cited as a major factor in reminding people to drink water regularly, with companies that provide their employees with a water solution reporting higher consumption.